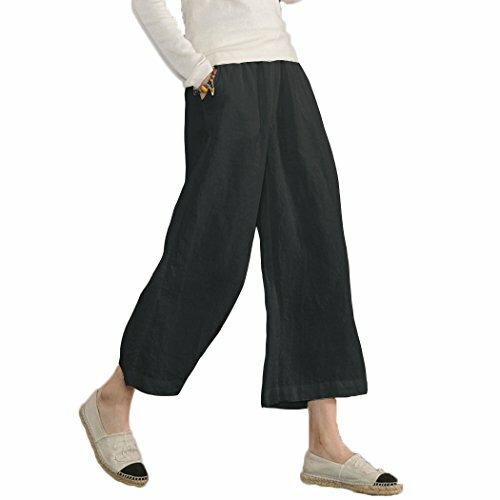 Ecupper Womens Casual Loose Plus Size Elastic Waist Cotton Trouser Cropped Wide Leg Pants Black 4 | What Should I Say? US 4=TagS ---Waist:26.7"-39.3" Hip:42.5" Length:34.2" Inseam Length:21.7"
US 6-8=TagM ---Waist:28.3"-40.9" Hip:44.0" Length:35.4" Inseam Length:22.7"
US 10-12=TagL ---Waist:29.9"-42.5" Hip:45.6" Length:36.6" Inseam Length:23.7"
US 12-14=TagXL ---Waist:32.2"-44.8" Hip:48.0" Length:37.0" Inseam Length:24.1"
US 16=TagXXL---Waist:34.6"-47.2" Hip:51.1" Length:37.4" Inseam Length:24.5"
US 18=Tag3XL --- Waist:37.0"-49.6" Hip:54.1" Length:37.8" Inseam Length:24.9"
US(18W-20W)=Tag4XL --- Waist:39.6"-52.2" Hip:57.1" Length:38.2" Inseam Length:25.3"
US(20W-22W)=Tag5XL ---Waist:42.1"-54.7" Hip:59.7" Length:38.6" Inseam Length:25.7"
This Trouser is suitable for the summer day,it is easy to match any shoes or tops. It is cotton fabric, which is nature plant fabric, suitable for the allergic skin too. Use neutral detergent, hand washing with cold water, avoid prolonged soaking, natural cool dry,ironing low. Suggest to Wash by Hand,Lay to Dry to Keep it in Good Condition. Free Return Policy. Any Queries, Please Feel Free to Contact Ume Store. If you have any questions about this product by Ecupper, contact us by completing and submitting the form below. If you are looking for a specif part number, please include it with your message.